I've posted here before and have received great advice! Hey kfunnyman - glad to see you back but sorry you are having troubles. You need refresh me anyway on what type engine is in this meaning flathead or OHV, hydraulic or mechanically adjusted valves - I don't have books that far back but have a clue. Some things that could be helpful are observations from a vacuum gauge put on a "T" to actual manifold vacuum. Another would be to check valve timing if not known all good newer stuff. A way to test that if in the cards at all is to set timing mark to TDC (engine cool + off) and turn engine (might be able to by hand) or crank bolt. Go back and forth watching distributor's rotor and how far it turns in degrees before rotor moves. Do YOU know if it's gear to gear done or with a chain? 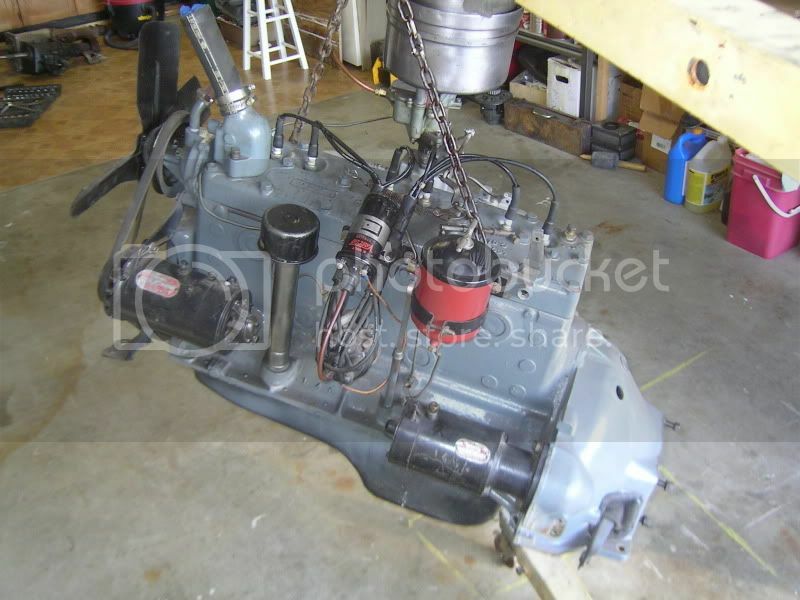 Did some Googling - if this shows is this your engine? Wheres all the electronic stuff?? Gotta love them old flat heads. I sure wish things today were simple and tuff like that. You are describing a classic lean carb. Try holding a shop rag partially over carb (dont let it get sucked in) . Does idle speed pickup? If so. Is the choke mechanism working properly? Did you adjust the idle mixture? Do a volume test on the pump ,disable the ign by removing (+) wire from coil.take inlet hose off carb and hold into a qt jar.Have helper crank eng over and see if jar fills quickly , steady stream. If all checks out and you are capable of removing top of carb while still on eng , after a idle till stalls , check level of fuel in bowl. What a hoot - I think this guy lives near me! Wasn't sure but am pretty sure now this is the engine if OE in this car. Asked him off line if he's the one and not sure but I'll go check it out in person if needed and or wanted and can do some tests. Just not sure I have a spare EEC module (oh laugh) for it left over or needle valve for carb but if just redone shouldn't need it. I really do have an electric fuel pump that I made up to run from a cig lighter and a jumper box so have the 12V too with long hoses at each end to transfer or empty fuel tanks mostly. Low pressure. Since this has done this before and after a carb redo it may have fuel but not volume as RT suggests. Yes. That's my motor. Thanks! OK - cool. Now from your first post on this that it felt like it ran out of gas it probably did or inadequate volume. Can you try a volume test? Dang - I've got the Snap-On kit where you put a thing in line to check pressure then take that off - put a hose into a glass jar and see how much/fast it comes out. Guess at pressure is a usual 4-6 PSI and should be able to fill a glass jar fairly quickly. 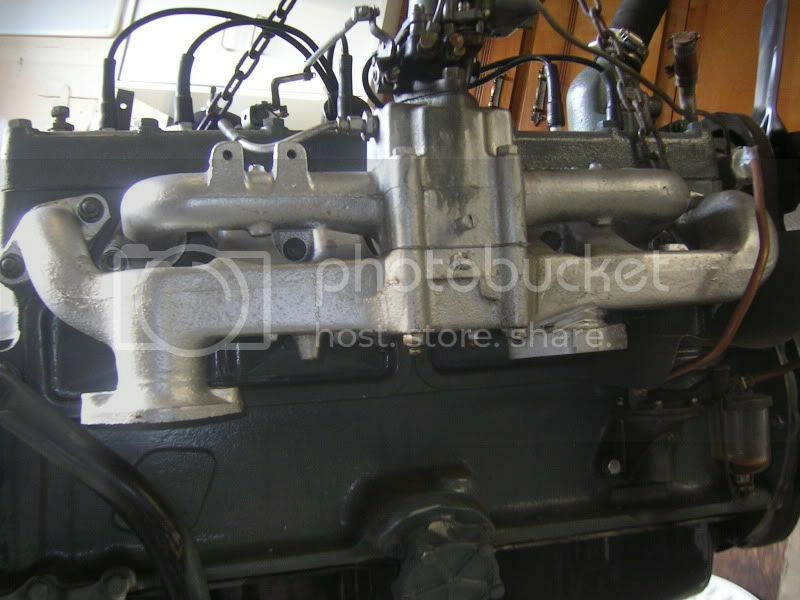 Without even engine running you could disconnect fuel line at carb - rig a hose and just crank. Not sure what is used if anything in tank for a "sock" where it picks up fuel which might not allow enough thru. This must be a manual choke and if leaving it part on may improve it or not. Bet is instead of a sock if anything just a brass screen in tank. You gentlemen were correct. Fuel pressure, timing and a few other things were the problems. I ultimately replaced the tank(which was in worse shape than I thought) and the fuel line which was so clogged that it was making the fuel pump work overtime. Or, i guess in this case, not at all. In any case, we're back on the road and happy as can be. I appreciated the sound advice. Happy motoring!